Fortunately this book is out of print, but if you are determined, it can still be found fairly cheaply. The dust jacket states that the author has written not only a history of horsemanship, but a history of marksmanship and I suspect that this is where his expertise lies. 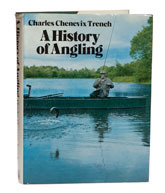 On the positive side, A History of Angling is the only book I know which attempts to cover the entire history of all aspects of angling and while it isn’t completely without its good points, the best compliment I am prepared to pay it is that I can’t quite bring myself to throw my copy out.